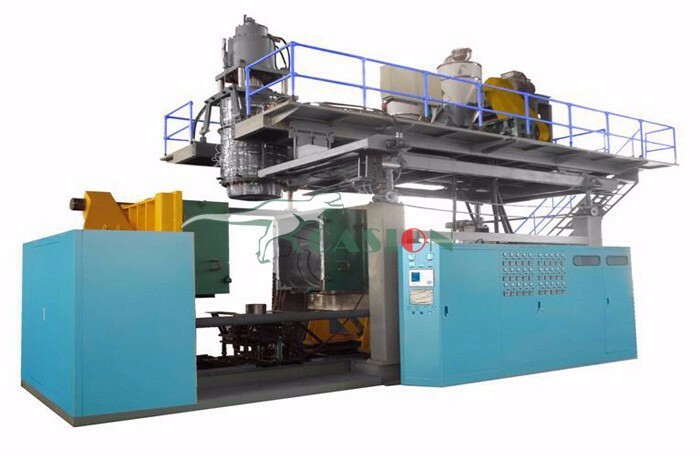 The Injection Blow Molding Machine is based on an extruder barrel and screw assembly which melts the polymer. The molten polymer is fed into a hot runner manifold where it is injected through nozzles into a heated cavity and core pin. The cavity mold forms the external shape and is clamped around a core rod which forms the internal shape of the preform. The preform consists of a fully formed bottle/jar neck with a thick tube of polymer attached, which will form the body. similar in appearance to a test tube with a threaded neck. Disadvantages: only suits small capacity bottles as it is difficult to control the base centre during blowing. No increase in barrier strength as the material is not biaxially stretched. Handles can't be incorporated.